Maggots Galore! Calling out for solutions! I’m searching for solutions to our maggot problem. Last year this was not an issue but for some reason they are suddenly popping up everywhere. We have maggots in our composting toilet, which gets filled with all household compost. I’ve read online to keep things dry which we have been doing. We are using LOTS of sawdust. There will be days where the little guys are crawling all over our floor. We’ve found eggs behind one of our cabinets. I’ve included a picture, they look like mouse droppings. The fly strips in this picture are just two days old. We are catching the fly’s right away which is good because we don’t want buzzing all around the house. As for moisture buildup our bathroom has ventilation installed. This summer has been unusually hot and humid with lots of rain. Perhaps it’s the perfect environment for larva? I will be cross posting to reddit and facebook. Any solid feedback will be greatly appreciated and the authors will be credited. Thanks tinyhome community! Nancy bates and a few others, who suggested putting food scraps elsewhere. Su Wu and others who suggested Diatomaceous Earth with its ability to pierce shells. Maverick Beckett who suggested 20 days of daily compost removal and more regular cleaning of the bucket. Eddy Harrell who suggested cleaning the bucket with bleach each time and emptying daily. If maggots are crawling over the floor it is a good sign you got an ongoing infestation, which is gone too far for just passive counter measuring. I’m not experienced with a compost toilet and such problem, but i know if you keep it too dry and more damp instead of wet, the flies will even like it more. http://www.supergreenme.com/go-green-environment-eco:How-To-Keep-Insects-Out-of-a-Composting-Toilet note from article: Some insecticides will simply break down. Meticulously look for the pupated larvae, these buggers can crawl quite far and will hide everywhere, where you have to look twice for them. Had that in a flat with a roommate who hastily dumped food in the bin and went on vacation while i was away too. Jesus, they were everywhere. Behind and under every shelve from kitchen, every bed, closet and wardrobe. Vacuum it. Dispose. Clean all the fly spots. Buy more fly straps, they are not that expensive, but several hommade traps will catch them too. Search the net, you basically need a big plastic bottle, a knife and a few household ingredients. Can is suggest ordering silica gel packets in bulk? These little packets that come in electronics that absorb huge amounts of humidity and change from dry (blue) to clear (humid) when saturated. You can leave them in the sun for an hour to reactivate them or microwave them for 2 minutes- 5 minutes. I use the large 0.5 lb bags (ebay cheap) and stuff my paper stock drawers with them to prevent paper from curling and bubbling. One 0.5 lb bag can absorb a huge qty of humidity, and are used after a fire to absorb water after the fire dept arrives and sprays everything down. They are safe to use and touch (do not digest though) and last forever. Of course keeping air moving even if it’s humid will minimize and reduce the pests as they hate air movement…use a fan in the bathroom. Lastly most insect (ants to grubs) detest lavender in all forms. I plant lavender in posts and in my garden to eliminate ants. They hate lavender oils that exude form roots and the leaves. For the toilet mix vinegar (50% volume) and water (49% volume) with 100 drops of lavender oil concentrate and spray the compost liberally for a week after each use, it’s safe for most floors and it kills mold and bacteria too. best part is the lavender is stronger than the vinegar smell and vinegar dissipate really fast. Good Luck! Oh, that is so what I’ve been afraid of with composting toilets. Have you tried adding diatoms to your toilet? That/s the first thing I would do. Diatomaceous earth is available in the gardening department. They are tiny shells that can pierce the bodies of bugs to kill them. Look it up. Good luck! If you can get your hands on The Humanure Handbook, it’s been very helpful for us. In the meantime, maybe try to not put your kitchen scraps in your toilet? That may be further aggravating the issue. We had a fly problem, although not in the bathroom, ours were in the loft of the house. My best guess is that the flies came into hibernate in the winter and came out in the hot weather of spring. We now hang up our lavender for drying in the loft and we don’t have anything like as many flies anymore. We have used composting toilets for more than 5 years now and never had a problem, although I have read negative things about separating the urine as it may create a smell, although I doubt this is the root of your problem the smell may attract the flies in the first place. I have heard lavender is a good idea. We will try that. 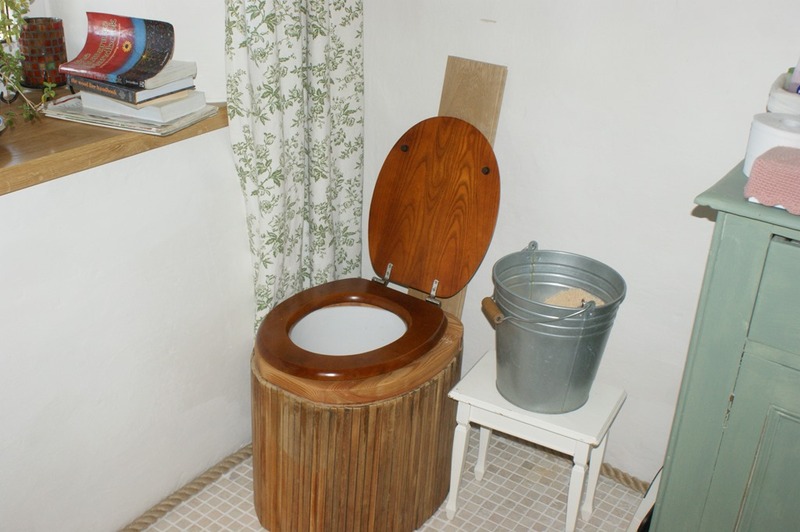 Is your toilet home made? Join the community and stay up to date with new articles and the latest news.